One would expect editorials in scientific journals to focus on what- scientific matters right? Wrong. At least where a particular editorial authored by Nigel Williams in Current Biology is concerned (“Call to Atheists,” Current Biology Volume 17, Issue 21, 6 November 2007, Pages R899-R900). "Call to Atheists"? The title is as strange as the contents. Imagine the uproar if the title had been "Call to Evangelical Christians" or "Call to Roman Catholics" and the content had urged those falling within such groups to devote their energies to advancing their values. Nigel might respond that such groups already do so and that a means of spearheading the interests of atheists must be found. But what are the interests of atheists? Except for their views about God do they share other common denominators? Nigel Williams not only believes atheists share values that extend beyond the descriptive belief that defines them, he also believes the advancement of such beliefs is related to the well being of science. Williams depicts atheists as a downtrodden lot which strikes me as odd. Particularly so as it relates to science. If you scratch the surface for reasons that motivate individuals like Nigel Williams you are best advised to look in two directions. First follow the money. Unfortunately government policies have an impact on funding research. This extends to the availability of funds themselves and the type of research that is most likely to be the beneficiary of such funding. As biotechnology advances so does the capability to use it in ways that were previously unimaginable. While those like Orwell could glimpse the general problem, the specific means by which science and technology could be employed to alter gene pools and change environmental conditions are now becoming evident in ways that are alarming. If you think intelligent design is a motivator then you must be following news events relevant to it. Critics are more likely to depict ID as creation or a "stalking horse" for it. The conflation has a political appeal but betrays ignorance- willful or not. The real drawback to editorials like that of Nigel Williams is a perceived loss of objectivity on the part of some scientists. The use of science and technology is the proper domain of the broader society. Value systems will inevitably clash. It should not be the role of scientists to become advocates for moral standards. This is especially so when choices impact where money flows and who benefits by it. There is too much at stake to allow scientists to become the gatekeepers for the values we hold- be they atheists or non-atheists. The Design Matrix has rolled off the presses and is now being sent to those who placed initial orders. Mike Gene's book should impact discussions of intelligent design in a positive way. Undoubtedly there will be the usual in your face critics, intent on denigrating the book even if they have not read it. But for those attempting to maintain an open mind, I'm optimistic that new insights will be acquired. It is too early to expect much in the way of feedback. However, two TTers have provided reactions at the Telic Thoughts blog. Steve Petermann wrote the blog entry And Now for Something New expressing his views about the book and bipod weighed in with this comment. Expect some book reviews at this site in the future. Perhaps a number of them which would include blog members as well as non-members wishing to take advantage of the guest post option. For now though I'd advise readers to get hold of the book and read it. It should be worth the effort. Not long ago, I received an offer via e-mail of a new book which is a response by Gerry Rzeppa to the "New Atheists": Dawkins, Hitchens, et. al. Sharon Rzeppa, Gerry's wife, had come across my Richard Dawkins parable and was kind enough to send me a copy. There are quite a number of good book-length replies to the arguments of Dawkins etc., exposing the flaws in his assumptions, methodology and logic and so on. In that regard, I think the interested reader is now amply provided for. I myself have recently made a serious response available as an MP3 download or as a presentation via Google Video: "Is Belief In Divine Creation Rational?" (and you can find links to other good material from there). In the parable, though, I took a different approach. Jesus himself told many parables. In his parables, transcendent truths were explained using everyday illustrations. The heavenly was captured through the mundane. What is not understood by many of Jesus' interpreters, though, is that in telling parables it was not his unambiguous aim to explain truth. In fact, oftentimes through telling parables he intended to conceal truth. 10 And the disciples came, and said to him, "Why do you speak to them in parables?" 11 He answered and said unto them, "Because it is given unto you to know the mysteries of the kingdom of heaven, but to them it is not given. " 12 "For whosoever has, to him shall be given, and he shall have more abundance: but whosoever does not have, from him shall be taken away even what he has. " 13 "Therefore speak I to them in parables: because they seeing see not; and hearing they hear not, neither do they understand. " 14 "And in them is fulfilled the prophecy of Isaiah, which says, By hearing you shall hear, and shall not understand; and seeing you shall see, and shall not perceive: "
15 "For this people's heart is grown fat, and their ears are dull of hearing, and their eyes they have closed; lest at any time they should see with their eyes, and hear with their ears, and should understand with their heart, and should be converted, and I should heal them. " The prophecy of Isaiah referred to by Jesus is one which is invoked more than once in the Bible (e.g. Acts 28:26, from a time about three decades later). It does not, then, refer only to what happened whilst Isaiah was alive. It contains a principle which is at work throughout the ages. Parables do not only teach us, but reveal us. They don't just pass on informaiton to us - they demonstrate information about us. What we understand from them depends not merely or even primarily upon our intellect, but upon the state of our heart. A well-told parable might leave the most brilliant mind completely confused - whilst being plain and simple to a little child. Don't you hate it when the Dark Side gets so clever? All of that now brings me to Gerry Rzeppa's "Some of the Parts". When Sharon offered me a copy of the book, I was expecting it was going to be an analysis and rebuttal of Dawkins' arguments in the manner of those already published. I was wrong! Gerry instead offers us an illustrated poem / story - short enough to be read in a quarter of an hour; but deep enough to leave you thinking for a good while afterwards. At first when I realised what its genre was I was fearful - such things are very hard to pull off and you have to be brave even to try! I need not have feared. I really enjoyed Gerry's response. He tells us a story - and it's a story which brilliantly captures the antithesis between Christianity and atheism. Joyful submission and hyper-skeptical folly; intelligent trust and angry fist-shaking are both beautifully portrayed within the lines. The book does not present an intellectual argument - it tells instead a story which, like the parables of Jesus, has the power to confound the wise whilst comforting a child. Is that because it's a foolish, childish tale? No, it's because it isn't written to be an intellectual argument; it contains only some of the parts - the rest being supplied from the pre-understanding of the reader. Gerry's tale is woven around a small boy, whose mother dies. Coming in from the rain (which I didn't realise the symbolism of in my first reading), he meets a mysterious figure called "The Maker". The Maker thinks thoughts. Our hero is led on a journey - the story is in parts. On his journey, he learns about the Maker's thoughts - present and future. Thoughts cannot be seen, or touched; and yet those thoughts are worth more than everything that can be. Rzeppa's story is one which anyone whose thoughts run along Dawkinsian lines will not understand. Should they come across it, they will mock and deride it - a childish poem, full of silly fantasies, no rational arguments in it. But if you, like me, love the living God through Jesus, then you'll find that Gerry's tale is itself more than the sum of its parts. Such stories are mirrors - in them we see ourselves. Mockers will find mocking; less cynical hearts will find food for thought and challenge. What is in this allusion? What does this symbol really mean? The story is undergirded by Christian teachings, particularly man's creation in the image of God - but how much they are appreciated depends on what you bring with you as you read; did I bring more or less than Gerry as I read it? Is my understanding of that truth the same as his? It's a short story. The response to the "New Atheists" needs to be manifold - replies must be made at different levels. Gerry's simple tale won't go down amongst the volumes of deep philosophy; but it will bring appreciative smiles to those who listen to it with ears to hear. Thank you Gerry and Sharon for sharing it with me. Bruce Chapman authored Judge Jones Nudges Judge Judy which notes Judge Jones's penchant for seeking publicity made possible as a result of a verdict handed down in the federal district court over which he presides. The case that made Judge Jones famous- Kitzmiller v. Dover- also enables him to bask in the limelight of the mass media and make speeches for which he is renumerated. That's the problem- a built in incentive to please the crowds through a process that should be free of the taint of bias. You have admire Jones's self-promotion ability. If he were an elected official he'd be called an adroit politician. It's too bad the concept of a fair and unbiased judiciary is tainted by a system that rewards jurists for their decisions. Abstract. It has been claimed that different types of causes must be considered in biological systems, including top-down as well as same-level and bottom-up causation, thus enabling the top levels to be causally efficacious in their own right. To clarify this issue, important distinctions between information and signs are introduced here and the concepts of information control and functional equivalence classes in those systems are rigorously defined and used to characterise when top down causation by feedback control happens, in a way that is potentially testable. The causally significant elements we consider are equivalence classes of lower level processes, realised in biological systems through different operations having the same outcome within the context of information control and networks. The paper, to which the abstract pertains, frames the soundest theoretical approach to intelligent design that I have come across. Despite the focus on cellular mechanisms and the natural selection concept, the ultimate issue distinguishing competing paradigms is causality. We observe selection associated with resistence to antibiotics, selection utilized during the course of research and in breeding animals. The last two can be considered consequences of intelligent design. Linking intelligent design to bacterial resistance requires a distinct theoretical outlook establishing the association. That distinct outlook may be the one found in the referenced paper which identifies causal dynamics characteristic of intelligently designed systems. They contrast with the bottoms up approach utilized in mainstream evolution and abiogenesis theories. The difference could mark an experimental approach able to distinguish between conflicting theories and provide the empirical footing needed to establish a scientifically viable foundation for intelligent design. This should be of interest to anyone involved in the debate over evolution, intelligent design, creationism, atheism, materialism, etcetera. (Apologies if you've already seen it over at BCSE Revealed). As most of you will know, in my "day job" I am a Christian minister. 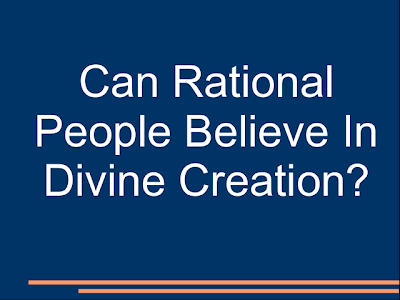 I have just put online a major new audio-visual presentation: "Is belief in divine creation rational? (responding to atheist claims)". The talk is 77 minutes long, accompanied by slides (combined courtesy of Google video), and goes over quite a wide field - rationality, morality, laws (or not?) of logic, Richard Dawkins, the scientific method, world views, the definition of the mind, etc. It's meant to be popular level but stimulating for anyone. You can watch the presentation with audio, or download it to your iPod, etcetera. Lots of links and resources provided. Of course it's a lot more heavyweight than the previous Richard Dawkins parable, but much more stimulating and rewarding and hopefully life-changing for it. If you like it, please link it. Put it on your blogs, websites, mailing lists, etcetera. As with the previous Richard Dawkins parable, the success of this depends on it getting linked.